Estimated homework hours: minimal, less than 1 hour per week. Required Materials or Books: sharpened pencil, eraser, ruler, felt-tip pen (ideal is waterproof non-bleeding like micron or sharpie no-bleed pen), protractor, compass. Mapping the World with Art is a blend of history, geography, and art. Goals for this class include: Understanding the countries of the world, how they sit in relation to each other, and their major geographic features. In class we will study regions of the world and improve our cartography skills. Students will draw maps of each region, starting with Mesopotamia and ending the year with Antarctica. 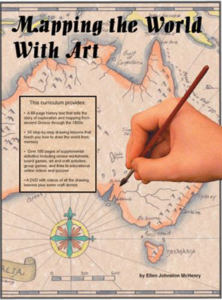 Class content is based on the DVD program ‘Mapping the World with Art’ by Ellen McHenry. There is minimal homework, but students wishing to truly memorize regions and their geographic features will need to review and practice at home. The textbook contains optional activities students can complete at home if additional learning is desired for your family. Samples of the textbook and DVD lessons are available online at www.ellenjmchenry.com under Store / Mapping the world… / then select the product and scroll down past the description. You can download samples of lessons and watch a few of the instructional videos.